Should Mormons in the Diaspora Celebrate Pioneer Day? It has only been in recent years that I have slowly become aware that not every convert to the Church shares my deep identification with the Mormon pioneers. I have loved the epic story of the trek to the Salt Lake Valley. I appreciate its archetypal connotations. My heart thrills with the stories of the pioneer heroes and heroines, and I consider each of their stories part of my legacy as a Mormon, though my LDS heritage begins with myself. In the last few years there has been some grumbling by members who don’t have Mormon pioneers in their genealogy that it annoys them to celebrate the July 24th holiday, a commemoration of the day the first company of pioneers entered the Salt Lake Valley. I think partly to appease these voices, there has been an emphasis on “modern-day pioneers”–those who lead the way for others to follow and who blaze trails in other ways than traditionally recognized. There’s a relatively new Primary song, “I Can Be a Modern-Day Pioneer,” there are more talks given by General Authorities on the subject, and there are articles such as the latest Mormon Times article “Pioneer Journeys of a Different Era.” There is a sudden dearth of Pioneer Day activities in wards outside of Utah, and in our ward last Sunday the only talk which mentioned pioneers emphasized modern-day contributions rather than those who crossed the plains. I just want to register a caution to those who wish to move away from the traditional veneration of these honorable forebears. I want to remember their devotion to a faith that meant more to them than life itself. 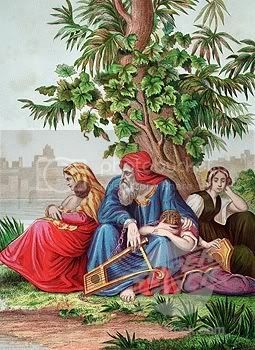 Social scientists often point to the Jewish culture and theorize that the reason it survived through so many years and the scattering of the people to so many different places was the very persecution which caused them to band together in small groups, and their longing remembrance of their homeland. yea, we wept, when we remembered Zion. This Psalm is a poignant lyrical device for recalling the story of Israel’s exodus from Egypt and its arrival in the promised land. It acts as an earnest reminder both to the exiled Israelites and to later biblical readers of the importance of the promised land for the celebration of the Jewish faith. Now that we Latter-day Saints experience little real persecution, and the importance of our history and sacred places is beginning to wane, are we in danger of losing some valuable aspect of our culture? Are we losing our Psalms, our legends, our traditional customs and stories? I do not feel a great connection, but I do feel a connection to the culture, which is important to me. 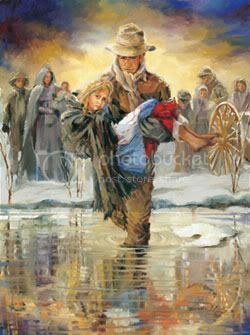 I do not have any Utah pioneers in my family, but feel a connection to the pioneers on the level of sacrifice for one’s beliefs. However, I think the holiday is unnecessary outside Utah. In fact, I didn’t even know it existed until I was in high school, because it just wasn’t celebrated where I grew up (near Syracuse). We probably put a lot more importance on April 6th due to our proximity to Palmyra. We had Pioneer talks last Sunday. The first was a man from Kenya who came to the U.S. and converted. The second focused on people who were the only members in their families. The last was about the Trek, but more about the celebration it should be that such a high percentage made it to Salt Lake Valley alive and not such a focus on the deaths. As time passes and the church spreads, there will be more and more converts who should be included as pioneers. I have lived in the British Isles all my life and am not aware of any celebration. An occasional ward or stake may have the odd pioneer activity but it is more normally regarded as an Utah or American day. In the ward I am in we did not note the day at all. Since I think I might be the catalyst for your post today, I will definitely answer. And clarify. I love and honor our righteous pioneer heritage. As a recent convert to the Church, I was brought to tears my first trip to Salt Lake City and temple square. There, I had a chance to visit the Mormon “Mecca” and pay homage to those who had gone before and all their sacrifices. I loved the Pioneer Day celebrations we participated in, when we lived in California. Utah? Um.. not so much. In Utah, it is mixed too far in with the ubiquitous culture and is used as a way to show American patriotism. I think it is weird in Utah, and I despise the way the Native Americans are dismissed and the horror that the unrighteous acts of our ancestors rained down upon them. So I say, BAH HUMBUG on Pioneer Day in Utah. So you don’t mind messing with Memorial day but don’t touch pioneer day? Yeah, sure. lol, that’s right. I am nothing if not inconsistent! (FWIW, I attended both my wards’ pioneer day event this AM and my parent’s stake pioneer day activity this PM here in New York, but if I were in charge, I would not have suggested we have a Pioneer Day activity). That being said, I am profoundly grateful for the people who built up this church with their blood, sweat, and tears. Who were willing to lay down their lives, in every sense of the term, to follow God’s will. I am also profoundly grateful to the Christians of the early church, who endured great persecution because of their faith, refusing to let the light die out. They too, built this church with their suffering and faithfulness. My connection to both groups (among many others) is based on the qualities that they share – the determination to live and die for what they believed. I honor them for it, and I am tremendously grateful for it. I think that their stories, all of them, are important and relevant and it would be foolish of us to forget them. However, I remain unconvinced that Pioneer Day and its attendant activities is meaningful or practical outside of Utah, particularly in areas where there are few LDS members. I think it is just too local in its meaning. This bothers me somewhat (no offense intended, BiV :D). I don’t believe that cultural artifacts have any real place in the gospel. Heritage is important, don’t get me wrong, but it shouldn’t be part of our *religious* practices. I think that any cultural grafting needs to be optional, for one, and local, for another. Joining this church should not equate to joining Utah-Mormon culture. Now, I don’t believe that you were saying that at all BiV. In context, I read your question as a generous invitation based on your own passion. I just wanted to offer some food for thought. I am a modern-day pioneer and I appreciate the sacrifice of the latter-day Mormon Pioneers and love to hear the stories. I have to say that back in 1997, during the Sesquicentennial, I thought there was a bit of overload on the subject that year. I just got back from our Annual Ward Pioneer day chicken BBQ. There was no Pioneer day activities, but there was tons of chicken! While I do not have Mormon pioneer blood in me, I do have pioneer blood just the same. My great great grandfather was a Kansas sod buster and pioneer. He brought his family to America on a boat from Sweden and then drove them from New York to Kansas in a wagon. He worked real hard to homestead his land and provide for his wife and ten kids. That kind of attitude by members burns me. I got even with her though. She just about passed peach pits when I wore a t-shirt from our old church to Primary on Wednesday. It had a cross on it. She just about went through the roof. When youre inconsistent, that usually means half the time youre full of… well, you know. For today’s pioneer day picnic here in 75-degree southern California, I wore a corset. Underneath a period-appropriate dress, of course. Yes, it was painful. Yes, it is exactly the sort of thing my pioneer ancestors (I got nuthin’ BUT pioneer ancestry) wore, at least those of the female gender. So it wasn’t any dumber than anything else folks do to celebrate the date. But it was more fun to me to see the youth from the Cambodian language ward (first one in the chuch) doing so much socializing with the the youth of the other wards than it was to receive all the compliments on my attire. I am of pioneer lineage on both sides, and was raised in the western United States where we always celebrated Pioneer Day every year. That said, I don’t now, nor I have I ever really associated much with the mormon pioneers. I always found the focus on the pioneers to be a bit overdone in the church and I think if anything it’s gotten worse in the past several years. On one hand I can understand the focus, since we’re still relatively close to the church’s formation and the trek west. However, I think the pioneer push is, to some degree, an effort to infuse nobility and pathos into the mormon narrative and mormon culture. That has always bothered me. I’m sure I’ll raise a few hackles with this comment, but frankly I have never seen quite the nobility in the mormon exodus that the church presents and that many mormons feel so passionately. In a very real sense, these people didn’t make a theological decision to migrate west, they made a survival decision. I am not comfortable with the idea that the pioneers were all a bunch of people who loved god more than their lives so they embarked on a perilous journey to grow the church, etc. They were literally driven west by citizens and governments that made it their stated goal to eradicate the church and its members. I have always found it interesting that the church presents on the one hand on the fact that the saints were forcibly driven out of their homes and towns, and on the other celebrates these god-loving individuals who migrated to the Salt Lake Valley out of obedience and love for god and the church. Those are two somewhat mutually exclusive positions. Either they were forced to leave or they chose to leave. I think the former is the reality. When someone is faced with relocation or extinction, not only do I think pretty much all people, god-loving or not, would choose migration, but I find it hard to consider doing so particularly noble behavior. I’m not saying there’s any cause to criticize the pioneers, I just don’t think they’re more noble than scores of other people of their time who were seeking out a better life for themselves. In fact many people of that time DID risk death, completely voluntarily, in an effort to make a better life for their families. As I’ve gotten older and learned more about the church’s history, and particularly about the church’s accountability in some of the persecutions the early members suffered, I have found the church’s celebration of the mormon pioneers even more distasteful. In my opinion, if anyone deserves the lion’s share of the praise in the early church with respect to pioneering, it’s the british saints who relocated to the U.S. in obedience to the brethren. These people propped up the fledgling church and risked every bit as much, if not more, to do so. Yet these saints receive relatively little attention, compared to those involved in the mormon exodus. All this said, I don’t have a problem with the celebrations in Utah, as it’s part of the state’s heritage. I just don’t think it necessarily transfers to all members of the church. I feel no connection to pioneer day. In my mind, it is a Utah state holiday, not a mormon holiday. I think the main reason for the push of the idea of modern day pioneers is an attempt to hold on to traditions that don’t mean much to the new generation of mormons. I respect the sacrifice made by the early Mormon pioneers. I also think celebrating Pioneer Day outside Utah is silly, especially stake-sponsored re-enactments for the youth. As I kid I got so tired of singing about how Pioneer children walked and walked and walked and walked and endlessly walked. OK, I get it. But let’s keep things proportional. Exporting Pioneer Day contributes to the perception that the Church is trying to turn every LDS congregation in the world into little outposts of Utah. That would be neither welcome nor helpful, I suspect. Let’s teach respect for the pioneers’ efforts, but leave the holiday and the adulation in Utah please. GRRRR…calling Mormons outside Utah “diaspora”?!?!?! There are July 24th celebrations in some wards and branches here in Eastern NC but nothing concerted, i.e. stake wide, etc. It is good to have those activities because I feel it helps to draw the ward or branch together. I feel a connection even though I have no ancestors that participated in that trek. I know that had those people not had that great faith and made that journey, the church probably would not have survived. ALT LAKE CITY — Departing from typical Pioneer Day themes, the LDS Church historian and recorder spoke of Utah’s 1847 American Indian population in his address Saturday at the traditional Days of ’47 Sunrise Service in the Salt Lake Tabernacle. “When the pioneers arrived here, there was already a substantial Indian civilization and culture existing,” said Elder Jensen, a member of the Seventy of The Church of Jesus Christ of Latter-day Saints. The pioneers no more “discovered” the Great Basin than Christopher Columbus “discovered” America, he said. I have 14 pioneer ancestors who crossed the plains. I love, respect, and admire their great sacrifices and look forward to meeting them some day. Their trials and courage amazes me. With that said, I feel it is critical that our talks and focus during Sacrament Meeting needs to be on the Savior. If we share stories and/or personal experiences, they should draw us to Christ, not to the person we are describing, and that includes our wonderful pioneers. I too was born in the Church, but have no so-called “pioneer” ancestry. Pioneer day celebrations, sacrament meetings, Trek, etc. get stale and old. And you’re never allowed to tell about what your ancestors did. As James (#11) above pointed out, it seems like those of us without pioneer ancestry are forever outsiders, and our own ancestor’s sacrifices and experience have no value. I appreciate what the LDS pioneers did, but it was the same kind of thing my own ancestors did, and for similar reasons. A few years ago the Mobile Alabama Stake youth participated in a 3-day 20 mile recreation of a handcart company, complete with encountering lawmen, lamanites, and mobs. It was very meaningful and informative since we are converts. And it was very HOT. Today I had scheduled all music around the pioneer theme but the talks were of a general nature. I believe that there are inspirational elements for all members in the story of the mormon exodus, and new converts benefit from becoming familiar with it. Diaspora? Really? How offensive to the majority of church members who are converts over the past forty years and have no connection to the mountain west or pioneers. I also think we need to minimize the celebration of a Utah state holiday and maximize the celebration of Holy Week and Easter Sunday. We have our priorities totally screwed up. I agree with others who have said use of the terms “diaspora”, “mission field”, and “Mecca” are incredibly disrespectful to those of us who live outside Utah. Utah is neither holy land nor homeland for most of us. SLC is just church headquarters. Wasn’t the third option to remain where they were and not practice Mormonism? Some DID remain–or migrated back. Opposition died down if they were quiet and didn’t assemble. There is relevance. Every new convert who deals with the ramifications of saying, “I am an actively practicing Mormon” has a bond. You’re being a bit dramatic. Pioneer Day, meh. Growing up in PA it was generally not practiced as very few had any pioneer heritage. Of course, the one family that did wanted the opportunity to extoll their pedigree and tried to institute it in the one year it happened to fall on a Saturday. I definitely have experienced it as more divisive than anything else – a cultural artifact of Utah that implies that one’s status is loftier if one has more Mormon generations under one’s belt despite being raised with relatively no persecution or discomfort. Those converts who came later are every bit as worthy of mention, IMO, but do we need to set off fireworks or hold a parade or pee in the wilderness? I think that’s all beside the point. hawkgrrl, at issue in your example is pride, plain and simple. It’s not about any virtues the Utah pioneers had (which, incidentally are not uniquely to be found with the Utah pioneers), those can be celebrated in many ways. But the sheer pride of that family and of comments such as Rangel’s and others and the OP for that matter, taking to task the “grumbling” members who feel ambivalence or “annoyance” toward Pioneer Day, and which seek to compel others to form some mythic and romantic “bond” which supposedly exists uniquely with that one generation coupled with the thoughtlessness of calling the majority of the Church the “diaspora” is insufferable and ultimately part of the reason people “grumble” in the first place. Jared T.: Say it with me — “that’s not how we do it in Utah”!! Right, ED. Though I haven’t heard that exact phrase so much, it’s implicit in the attitude manifested sometimes. I think we’re reaching a critical mass that will begin to drive local areas to learn more about the history of the Church in their areas. They will then begin to have Pioneer Days according to their local stories. I have felt that need in the last few years and so I have embarked on a wide-ranging project to recover the history of the Church in South Texas. There was a small effort undertaken in the 70s, but the text is unavailable anywhere in the ward libraries or files. You can read about some of what I’m coming up with here in a this talk that I gave in Church last Pioneer Day. You’ll notice the almost hysterical response by one Utah Pioneer descendant. Another later on says it’s messy, but he misconstrues or misunderstands or both what I did there. It becomes a little further stretched when you try to connect with the pioneer stories when living in Melbourne Australia. I’m with Jared T. I’d be more interested in the history of early members in my area as a means to better identify with those that came before and established our wards and stakes in a far flung land. I’m not diminishing the part of Mormon history that is connected to the trek thos pioneers made to Utah, but have a hard time finding relevance to it from this far away. Thanks, dmac. And with all this pushback, I think it’s critical for me to say that if doing all this is what connects you to the past and fulfills you, fantastic. There’s no desire here to diminish it for you. I do think some things are just plain overdone, but I’m not trying to say the Utah pioneers shouldn’t be celebrated. But what I am saying is that it is not the case that the whole church needs to feel compelled to celebrate them a) as some sort of unifying force for the whole church or b) as the go-to example for the whole church of certain virtues. The Gospel of Jesus Christ unites us across boundaries and we all have local heritage that embodies these virtues. I’m also reacting against the culture of royalty that has already been alluded to before this. I’ve been in Utah 10 years and it’s readily discerned in my experience with even Handcart descendants telling me that there is a hierarchy of pedigree with handcart descendants at the top. Also, as Elder Jensen recently observed and David G. over at the JI also, silence and forgetting portions of the Pioneer story is a potentially oppressive force in its own right without the presence of overt jingoism. I do like the suggestion of sharing stories of early converts that were local to each region and others who helped settle that area. To me, that’s far more relevant to those living outside Utah. And I do think it’s valuable to honor those who converted against oppression (many of the current generation of converts). The other issue I have is that the Mormon pioneers (like all mythic heroes) don’t and can’t live up to the exaggerated stories. They also behaved badly sometimes, were rash, even selfish. A closer examination reveals foolishness along with their virtues as it does with all generations. These stories get mangled in the passing down. Let me preface my comments with my pedigree as a disclaimer: my ancestors were: 1)American Mormon pioneers who crossed the plains 2) emmigrant Mormon pioneers who crossed the plains 3)emmigrants who were not Mormon, but still migrated to the frontier, and finally 4) descended from early American colonists, not Mormon. I am either a first generation member of the church, or any number of generations. SO- as a child, I loved the whole pioneer parade with costumes (celebrated in northern California). Now, I’m not a costume lover, but I am a lover of understanding history, whether political, religious, family or otherwise. If some have thrown pioneer celebrations that made those who are not pioneer descendents feel marginalized, shame on them (both). Part of why the early members of the Church were persecuted was their own bad behavior, and remembering the past helps us to not repeat it, right? I’m not suggesting that we read stories about the early members faults on July 24th, but rather that we celebrate where we are today, and acknowledge that we are benefitting from those who came before. And at the same time, acknowledge that there will be no future for the Church if we don’t make the sacrifices required in our day. I have no pioneer heritage whatsoever. The church here has shallow roots, because a lot of the Scottish members emigrated, and never came back. We do have a dual problem here though – as Scots our own national heritage is more or less ignored a lot of the time, and we have Britishness (i.e. Englishness most of the time) and American stuff rammed down our throats. All fine and well, but we are neither of these, we are just Scots. The Pioneer stories are inspiring, but the stories of Mormonism in Scotland, past and present tend to be ignored. I’d imagine there are some phenomenal stories of Mormonism in Scotland. I hope someone out there is working to recover and preserve the stories of LDS there. If not, please consider starting something or contact the European Mormon Studies Association (euromormonstudies [dot] com] and pick their brain about what might be done. It has to start somewhere. Best of luck. This doesn’t directly address the Op, but you might find this bit interesting from The National Park Service’s Mormon Pioneer: Historic Resource Study. “Contrary to myth and popular belief, this 1847 trek of approximately 1,032 miles and 111 days was not one long, unending trail of tears or trial by fire. Over the decades, Mormons have emphasized the tragedies of the trail, and tragedies there were. Between 1847 and the building of the railroad in 1869, at least 6,000 died along the trail from exhaustion, exposure, disease and lack of food. Few were killed by Indians. At least seven people were bitten by rattlesnakes, none of whom died. To the vast majority, however, the experience was positive — a difficult and rewarding struggle. 1) Death was a common occurrence on all pioneer treks. Not true, as most who started for Utah arrived. For example, no one died in the original 1847 pioneer company to Salt Lake. The average death rate in all Mormon companies was less than 3 percent; a third of the companies (more than 80) did not have any deaths at all; only 18 of the more than 250 companies experienced more than 20 deaths en route (7 percent of the companies accounted for 43 percent of the deaths). Yes Jared T, there are. But they’re little known. Because they’re often told from an American perspective, or submerged into a British context, they can lose something. The founder of LDS Sunday School was a Scot. The first major Mormon writer was also a Scot. Sadly though, he is forgotten, although his descendants, the Lyons seem to be well known in Utah. Pres. McKay served his mission here, and had a great love for the country of his ancestors. However, most of this has been lost and forgotten in Scotland amongst the LDS themselves, let alone the wider Scottish population. Some mining villages in Scotland became heavily Mormon, particularly in Midlothian. But again, this is forgotten. BYU Studies did a volume on British Mormon history, but that’s the problem. Scottish stuff often gets lost in any British context. There needs to be some kind of work done specifically on Scotland (not to mention Ireland, Switzerland, Holland etc etc)* It can be written by Americans, I’ve no problem with that, but it needs input from this end, if only in the editing. There were some factual mistakes and spelling errors in the volume… all of which could have been remedied with some local knowledge. Anyway, the long and the short of this is that we don’t feel anything for the stars and stripes here, or at least we don’t have a completely rosy image of it, if we do. The union jack is accepted by some of us, and hated by others of us, but that’s how the LDS sees the British Isles, even the Republic of Ireland. I hope one day we have our own temple. * The only place which has had some significant work done is Wales, mostly by Welsh language scholars. I’m dissappointed not to find other comments on this blog!!! 🙂 As a Mexican American, new convert to the church, I am struggling with how to embrace Pioneer Heritage. I was hoping to find insight, but perhaps can offer to share some instead. I do not claim to represent all Latino or American minority LDS converts, and certainly acknowledge that the unique experiences and encounters of my life are what have shaped my way of thinking and feeling – which may or may not be shared by others of similar backgrounds. That said – I believe that my biggest challenge in feeling any connection to the church’s pioneer heritage is rooted in the feelings I carry inside – which are an innate wariness of blonde and blue – not rooted in dislike, or even distrust, but just a reality ingrained in me from childhood. Much the same way that parents teach children the behaviors that are required to avoid other social taboos – in my experience, the two generations above me, each individually and separately counseled me at various points in my life that as a Mexican American, I was different to the blonde and blue and that as a result there would be situations where I would be treated differently and where I would have respond to things differently, so as to temper the level of bias I was experiencing at that moment in time. It’s a skill that I believe all people of color living in the U.S. teach to their children, although most won’t openly discuss it. Anyway – I believe that this feeling of separation from blonde haired, blue eyed America, is what makes it difficult for me to embrace Pioneer Heritage. Of course I can embrace it and value it for the role it played in establishing the church – a church which I love dearly and can not imagine my life without. I can respect and appreciate the pioneer heritage, but still I have a hard time identifying with it in such a way that it feels like it’s “mine.” I can’t imagine myself putting on a bonnet or pushing a handcart at a picnic, because those things couldn’t be any farther from what my heritage actually is. I joke among my ward sometimes that perhaps I will come to a Pioneer Day celebration one of these years, but if I do so, I will come dressed up as a Lamanite. It saddens me that this part of Mormon culture doesn’t seem to fit me. I hope this openess doesn’t offend any readers. It is meant to be an honest expression of my own personal experience only. If any part of this is found to be offensive, perhaps it can stand as a testimony that Latino converts such as myself accept the gospel without taking (or holding onto) offense about the reputation of the Lamanites – from which we are descended. It takes a humble heart to come into the fold wearing a mark on your skin, but if nothing else, it testifies that the heart that beats beneath the skin throbs valiantly in love for the Lord. You don’t need pioneer ancestry to celebrate Pioneer Day! That’s not the point of the holiday. It’s church history. It doesn’t matter where you live, or your ancestry, we still venerate the pioneers who crossed the plains to establish Salt Lake City so that the church could grow and thrive. Certainly, in Utah they celebrate it more – because it’s an official holiday, and because it would be totally disrespectful to the memories of those pioneers if we acted like it was a day like any other. We celebrate the wise men going to visit the Christ child, but I don’t live in the Middle East, I’ve never been to Bethlehem, my ancestors come from Northern Europe. You don’t have to feel a “kinship” with the pioneers, or “identify” with them. You are part of the Church, and should be respectful of the people who sacrificed so much so that you could enjoy your church membership today – whether you be from pioneer stock, or a convert, or have Lamanite blood in your veins. The reasoning for new members to resist pioneer day celebrations fall flat on me. Yes, my genealogy missed the whole pioneer movement while waiting out in South Caroline and Alabama. My wife is the first LDS in her family and it would be difficult to find any of her Cuban ancestors that relate to the Mormon Trail. I AM a Son of the American Revolution. My wife is a refugee of the Cuban revolution. I did not know that I was a SAR and yet still I celebrated the 4rh of July and even got excited about pilgrims and puritans. I am grateful for what the early pioneers did to make it possible to send missionaries to my grandparents. I’m grateful they built BYU so I could find a most excellent partner while I received a most excellent education.I also celebrate Bastille Day although my only connection with the French is two years I spent there between 1976 and 1978. The Church of Jesus Christ of Latter-day Saints is a family. When you are confirmed you are adopted in with full rights to all those who came before you. As a matter of fact, I’m sure my spiritual Father (notice the cap) was on the trail to Mexico, I mean Utah. I like escargots. I celebrate green jello with carrot shavings. I know what frog-eye salad is and crave funeral potatoes. The message of Christ was to learn to celebrate through the joy of others, to find happiness in their accomplishments (I call it “parenting”). I have no problem becoming the collective of Saints that followed the Platte. They probably envy me my SUV. Using “diaspora” to describe non Mormon Corridor LDS? Really? I personally find that identification problematic. I, for one, do not count my “homeland” as Utah and imposing that identification on me and others like me is not correct. Are Japanese LDS “in diaspora?” Are Mexican LDS “in diaspora”? Is the majority of the Church “in diaspora”? Are we “in Babylon” while the rest of “you” are “in Zion”? It’s precisely this type of cultural arrogance that is part of the reason why there is the type of push back you describe in your post. It’s bred from the same insensitivity that continues to refer to the world outside of Utah as “the mission field” as if Utah didn’t have five or six missions in it. And even if it didn’t have missions, the “us-them” separation of such a statement is the persistent thread. Your post is fatally flawed in failing to understand what a diaspora is and misapplying it to a wide swath of people. Furthermore, a conference at UVU a few years back properly placed the Mormon “outmigration” in an early 20th Century context, again, of those living in Utah and identifying with it and then leaving it. An added set of terms that I find to be problematic is to refer to those that crossed the plains as “The Mormon Pioneers” which you also use in your post. Using the general terms “Mormon Pioneers” and the definite article “the” before it signifies that this is the only body in the Church that can claim the Pioneer title. This is incorrect and marginalizes the contributions of the thousands of others who may be claimed as pioneers in other contexts and lands. A more precise rendering like “Utah Pioneer” (as in the Daughters (and Sons) of the Utah Pioneers organization) would be more appropriate. Finally, if one desires to take on that identity and embrace the Pioneer epic and the Utah homeland, that is perfectly fine. One may sing and praise it and hold parades for it and gush and whatever. All of that is perfectly fine. Nobody, not me to be sure, is saying that it’s wrong to feel and participate in these celebrations. But what is not ok is turning and insisting that the rest of the Church feel that way as well. It is not ok. There are many reasons to be appreciative of the Utah Pioneers and their sacrifices. The story of the Church’s move from being headquartered in Nauvoo to Utah (and of course, the narrative obscures anyway the thousands of LDS who did not take that journey and with quiet persistence built the kingdom in their own states and lands, but well, no surprise there) is important to the Church’s institutional history. But in the scheme of things of importance to the Church’s institutional history, I can think of at least a half dozen other events that would, to me, better merit a celebration, not the least of which is the First Vision. However, there is no yearly First Vision Day, First Vision Parade, First Vision Celebration, First Vision Tabernacle Choir Commemorative Broadcast. Yet, by not going to any such thing, am I looked at as being any less appreciative of the First Vision? No. However, once I feel a disinclination to the festivities of Pioneer Day, all of the sudden I’m not properly respecting the Utah Pioneers or their sacrifices? I’m failing to remember their contributions? Balderdash. I observe a quiet respect for the Utah Pioneers and their achievements in the same way I observe a quiet reverence for other peoples, events, and processes that makeup our shared legacy of faith and history, and I don’t have to go to a parade or have an identity imposed upon me to do so. I also joined the Church as an adult, and far away from where I grew up. I have never lived in Utah. But I treasure the collective memory of hardship our Pioneer ancestors left us– whether in spirit or by blood. I have cringed hearing members from Utah gush about being excited to be out in the “Mission Field” (especially when I lived in the UK), but yes, I am part of the diaspora. Zion as a place is lost to us all for now because of terrible persecution. But the dream of gathering in our stakes remains. I cherish that dream. Who is the artist of the rescuer carrying a child across the river? I’m seeking permission for use of the painting.